Disclaimer: as of 2017, this integration is no longer supported due to breaking changes to the API of Getty Images. However, you can harness the power of UI extensions to create your own, custom integration. Imagine the web without photographs. As powerful as written word is, sometimes it just cannot surpass the expressiveness of a bright, colourful, vivid shot. The images, be it photographs or illustrations, are essential for communicating an idea, and sometimes even an emotion, appropriately complementing the narrative. For many Contentful clients, especially those in media and publishing industries, telling stories with images is a part of everyday routine. To visualize their stories they search for content on stock photography website where they can license images and video for their projects. Among the multiple providers Getty Images stands out by offering premium-quality imagery and related services. The typical workflow of a photo editor often looks like this. While working with content in a CMS, they open a new browser tab and navigate to the a stock photography website, where they find an appropriate image, license it, download it, only to return to the CMS to upload the image to the media asset collection. This might not sound exhausting when done once, but photo editors operate with a lot of images every day. When the team from Axel Springer’s Ideas Ventures asked us to simplify their photo editors’ jobs by integrating Getty Images with Contentful, we took the opportunity to improve the workflow. And we've done it. 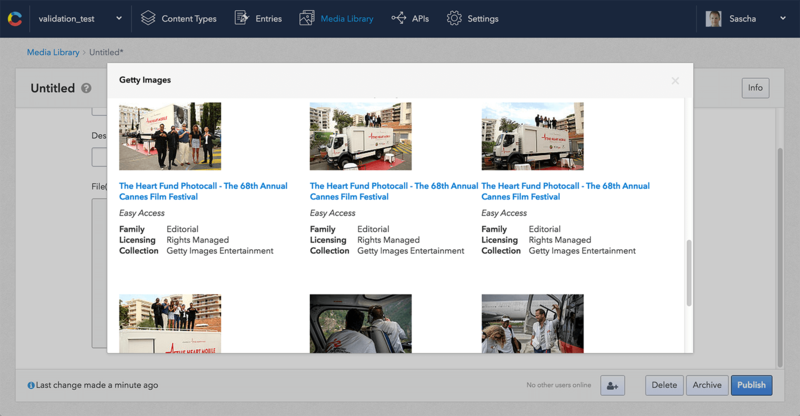 Photo editors at Axel Springer can now search, copy and save images from the Getty Images collection to their Contentful media storage – all within the Contentful web app. The editing workflow becomes smoother, as the editors don’t have to switch back and forth to the Getty Images website. The integration is based on the Getty Images API. If you’re interested in enabling the Getty Images integration, please get in touch. Please note that this is a premium feature of Contentful, thus subject to some extra charges. You would also need to have a valid license agreement with Getty Images in place. There are other integrations that we’re planning for the future. Let us know what services you would like to connect Contentful with: please contact our support. We prioritise the roadmap according to the public demand.